Today's Monday Map looks at the percentage of federal income tax revenue from each state that is paid by filers with incomes over $200,000. 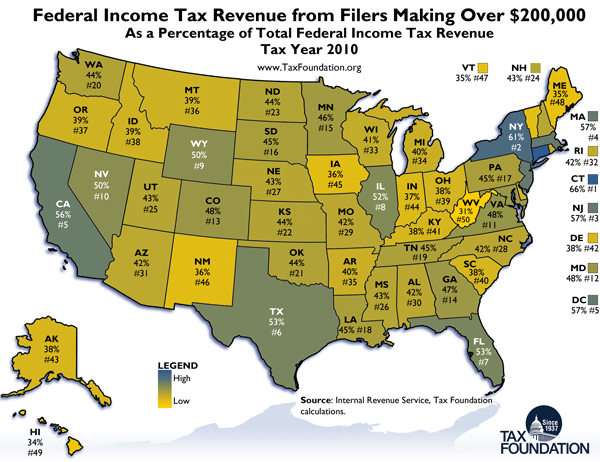 Such filers make up a small percent of the population but pay a high percent of total tax revenue. Given that President Obama proposes to let the Bush tax cuts expire for single filers earning over this threshold (and for married filers earning over $250,000) this map gives an idea of the states that would be most affected.